Our research typically focuses on polling the leaders of service organizations. To that end, we’ve documented field service progress and challenges extensively. We look to continue to do so via our ongoing coverage and our annual Smarter Service Symposiums. Recently, we’ve branched out into getting different perspectives from the various stakeholders in the field service delivery chain. In May 2016, we published a report highlighting key take-aways from direct surveying of front-line field service technicians. The research yielded valuable insights, specifically around the day-to-day obstacles encountered by technicians in getting work done. We will continue our focus on technician-oriented research. 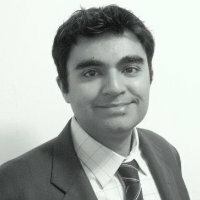 There are several other stakeholders that we are working with to present unique perspectives on field service performance. Perhaps none is more important than the end customer. There has been a great deal of research conducted on customer feedback regarding customer service and customer experience performance. However, very little has been done on field service performance. Therefore, earlier this year, we embarked on a research survey that polled 650 consumers across the U. S. regarding their perceptions of field service and their recent experience with field service organizations. (We defined field service as work that was done at the respondents’ primary place of residence by a visiting field agent or technician. The work could be tied to installation, inspection, repair, replacement, maintenance and certain types of delivery). Nearly all of these consumers were homeowners and dispersed all across the United States (International research will be forthcoming). Over the course of the next 2 weeks, we will publish several of the results from our extensive survey work. This initial wave of publication will feature 3 blogs and will culminate in a webcast on Thursday June 30, hosted by our partner ServicePower. 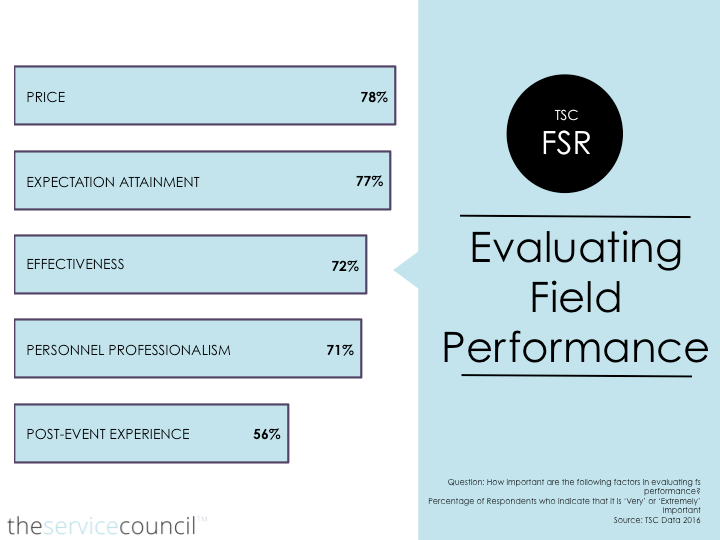 Blog 1: Field Service Performance: What Resonates? First things first. 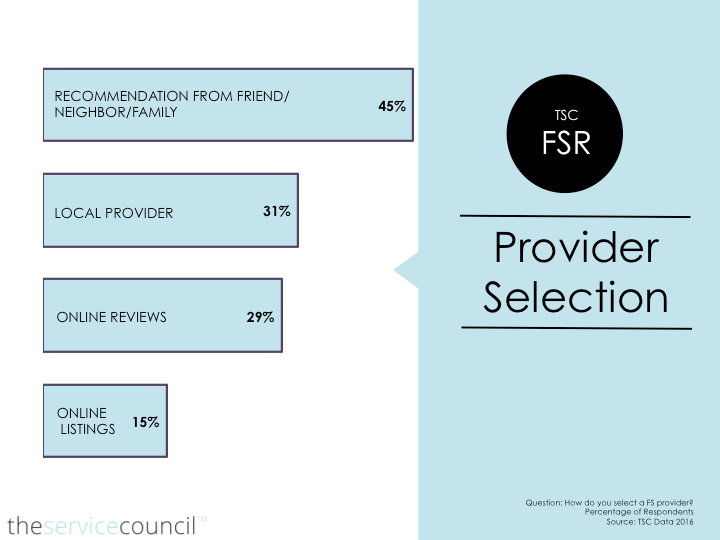 How do consumers find or shortlist field service providers? Well, most of them look at some sort of recommendation or review to narrow the playing field. As seen in the chart below, nearly 50% rely on the recommendation of a friend or family member. Another 30% rely primarily on online reviews. Interestingly, men in our survey (48% of survey population) were much more likely to rely on online reviews while women were much more likely to select local service providers. Both groups still ranked recommendations are their top means of selecting field service providers. From a geographic perspective within the US, most regions fell in line with the overall results. Participants from the Midwest (25% of population) were much more likely to look to local service providers than those in other regions. The scores for the top three are fairly close. It should also be stated that most customers with repeat service work are more likely to pick their provider based on past work or reputation than on price. For first-time transactional work, the selection of field service work is most likely to be done based on a combination of price and reputation. It should be noted that in several circumstances field service providers are selected for the customer, as in the case of a post-purchase or warranty situation. This becomes relevant when we dig deeper into field service performance evaluation. That said, the rankings above reflect the choices in self-selection. Once work is completed, the evaluation of field service performance is tied to price and expectation attainment. As seen in the chart below, these are areas that are most likely to be deemed ‘very’ or ‘extremely’ important. Expectations, such as time of arrival, service window length, or guarantee of work, are typically set pre-visit, and can have a significant impact on the customer’s choice to engage in repeat business with the service provider. In our next blog we’ll talk about several missed opportunities when it comes to on-site field service performance. If interested in learning more about this research, please feel free to log into our summary webinar taking place on Thursday June 30 at 1030am Eastern. You should also feel free to contact me directly at sd@servicecouncil.com.